I consider myself a real fan of Genesis’ music and I have been ever since I was 15 years old. In fact, it was the album Selling England By the Pound that actually made me a fan of music in general. After I had heard it for the first time, I could not stop myself buying records; always with the hope, I then became to realize, to somehow recapture such an aesthetic, intellectual and emotional pleasures their music had given me for such a long time. It goes without saying that I am particularly a fan of the Peter Gabriel’s era: I believe it is Genesis’ former years that every true fan loves the most, although several records from the early Collins-Banks-Hackett-Rutherford era are also highly appreciated too. 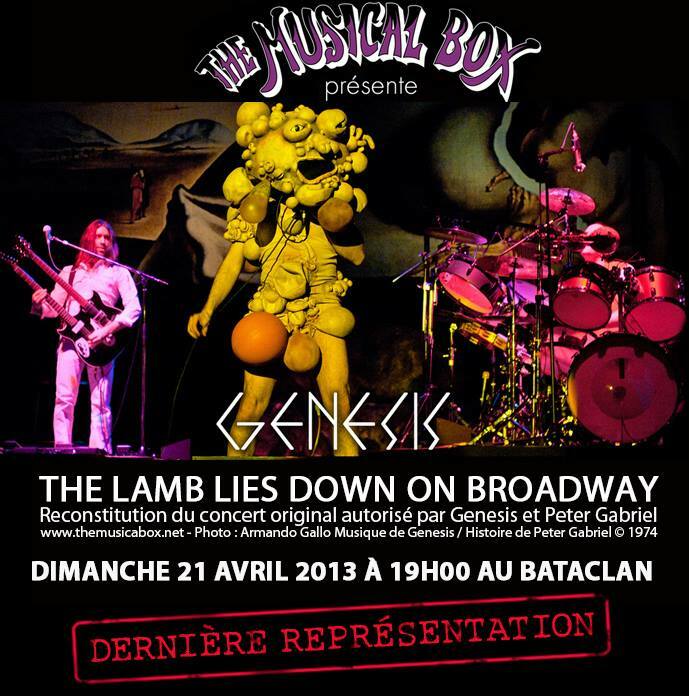 Unfortunately, I was only 9 years old when Genesis came to Portugal to play The Lamb Lies Down on Broadway in Cascais, soon before the band was split in 1975. And, believe it or not, there were no other venues. This made me go to Aula Magna in Lisbon the other day just to see The Musical Box, a Genesis tribute band formed in Canada in 1993 that plays the earlier Genesis’ albums, more specifically that created before the left of Peter Gabriel. The Musical Box has not only Genesis’ agreement to play their music, but inclusively the band’s help to accurately re-create it. In addition, The Musical Box band was granted full access to the original album master tapes so they could correctly reproduce the sound live on stage. Since then, the band have been touring the world to perform setlists including themes from the albums Trespass, Nursery Cryme, Foxtrot, Selling England by the Pound, The Lamb lies Down on Broadway and A Trick of the Tail. I have heard that they are strikingly similar to my much-loved Genesis. They are known to be remarkable on stage, not only from the musical point of view, but also by all the scenery and performances, which are ‘obsessively’ studied to be as close as possible to the original. Nevertheless, I have to emphasise that I never expected the concert to be as exceptional as it was. What is more, from how the audience behaved, I can assure the reader that almost all the audience felt the same. Moving further, despite the fact that I am a fan of Genesis music, what made me write this note is my belief that ultimately The Musical Box are a case of a live museum of immaterial heritage. In deed, I particularly draw on Barbara Kirshenblatt-Gimblett holistic understanding that immaterial heritage must be performed to be transmitted to highlight the singularity and the relevance of The Musical Box work. One then might ask: but who decides about the value of Genesis popular music’s as ‘heritage’? I believe the number of fans clearly advocate to their music as heritage. Furthermore, several authors coming from the fields of Ethnomusicology, Popular Music Studies, and Museum Studies – to mention only a few – have been insightfully advocating to this. To sum up, they have been reflecting on several initiatives taken by a range of public and private national actors: classic albums live, websites and blogs, national biographical dictionaries, museums and exhibitions, memorial plaques, statues celebrating idols, houses, key national texts and legislative documents, numerous DYI (do it yourself) personal and institutional actions engaged in the preservation and uses of popular music, musical and live events. I certainly subscribe to all of these interesting discussions. Nevertheless, I also have to mention that I have never seen, so far, a more suitable approach to celebrating immaterial culture as heritage as this practice of a tribute band playing what cannot be played live anymore by an original band. It is the live performance which matches the fostering of heritage the best. Ultimately, a tribute band ends up being a live museum for immaterial heritage to be exhibited. This does not mean excluding popular music from the more conventional form of museums, which I also find insightful and engaging, but rather it broadens the approaches to this emergent form of heritage of popular music. A final remark, why has UNESCO never acknowledged, drawn our attention to or even mentioned such initiatives, so far?